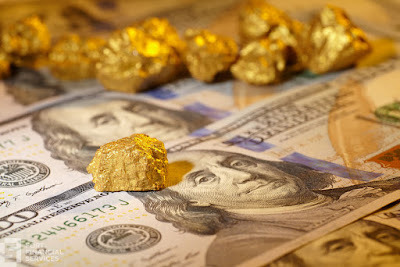 Gold prices moved higher in Asian trade on Thursday despite growing speculation that the Federal Reserve will continue to hike interest rates sooner than initially thought. On the Comex division of the New York Mercantile Exchange, gold for April delivery eased 0.28 percent to trade at $1236.80 an ounce as of 06:45 GMT. The Federal Reserve Open Market Committee minutes from the latest policy meeting showed that the regulator is considering a rate increase "fairly soon". This confirmation pushed the US dollar higher, pressuring bullion prices along the way. The February encounter was the first one under a Trump administration and it was marked by higher levels of confidence in the private sector, as speculation continued to build on higher fiscal spending, tax reforms and deregulation promises. "Many participants expressed the view that it might be appropriate to raise the federal funds rate again fairly soon" if economic and labor reports continue to be "in line with or stronger than their current expectations," the Jan 31 - Feb 1 meeting summary said. However, FOMC members noted that the Trump administration haven’t showed yet the real effect of its new economic policies and it might be risky making a move without accurate data. "Most participants continued to see heightened uncertainty regarding the size, composition, and timing of possible changes to fiscal and other government policies, and about their net effects on the economy and inflation over the medium term, and they thought some time would likely be required for the outlook to become clearer," FOMC minutes stated. Gold is sensitive to moves in US interest rates as they lift the opportunity cost of holding non-yielding assets such as bullion. Oil prices edged higher on Thursday morning, adding more than 1 percent as an industry report reported an unexpected decline in US crude stockpiles last week. US West Texas Intermediate oil futures traded at $54.03 a barrel on the New York Mercantile Exchange, up 0.82 percent from its previous settlement. The London-based Brent crude oil futures rose 0.79 percent to trade at $56.28 a barrel as of 07:45 GMT. The American Petroleum Institute said that crude inventories dropped by 884,000 barrels in the week ended February 17, leaving the total count at 512.7 million barrels. Market analysts had forecasted a 3.5-million-barrel build. These figures built a stronger case for the OPEC-led output cut agreement, reviving expectations that it would promote higher energy prices in the short term. A few days earlier, the oil group recognized the level of compliance among OPEC and non-OPEC members is high. By the time, non-OPEC producers that participate in the output agreement have delivered nearly 60 percent of the promised reduction. The oil cartel has agreed to shred 1.8 million barrels per day from global output in the first six months of 2017. Today, traders will keep an eye on official crude inventories from the US Energy Information Administration at 16:00 GMT, a day later than the usual due to the President Day’s holiday. You can order a text here https://persuasivepapers.com/. They would write an interesting post to improve your site's position!